The award-winning science fiction epic short film, Deployment Strategy, is now available for purchase on the film's official website, http://www.DeploymentStrategyMovie.com, and Amazon.com. In the four months since its completion, the 30 minute action-packed film is already an official selection at nearly a dozen festivals where it has been nominated four times for Best Science Fiction and Best Special Effects awards. We found each other and collaborated on the 'net via instant messenger and video conferencing software like AOL and Skype. Audio and video proofs were exchanged via a shared FTP server. The award-winning science fiction epic short film, Deployment Strategy, is now available for purchase on the film's official website, http://www.DeploymentStrategyMovie.com, and Amazon.com. In the four months since its completion, the 30 minute action-packed film is already an official selection at nearly a dozen festivals where it has been nominated four times for Best Science Fiction and Best Special Effects awards. Deployment Strategy won the coveted Best Science Fiction award at this year's The Indie Gathering Film Festival in Cleveland, Ohio. Deployment Strategy is set 50 years into the future and explores how society and its government deal with existence and proliferation of artificial intelligence (AI). The government's attempts to regulate the software industry is undermined by file sharing piracy networks and, as a result, a military-backed cyber crime division of the U.S. Homeland Security is created. In a time of social unrest and economic inflection, computer hackers find themselves as highly coveted resources of both corporations and governments vying for power. A young soldier's beliefs are challenged when he is sent on a mission to detain a rogue AI programmer. 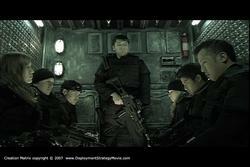 Deployment Strategy was directed by MTV/Nickelodeon's Mark Cheng- a software developer, designer, and filmmaker. While the film is packed with gun fights, powerful visuals, and raging cyborgs, Cheng sees it as a thinking-man's story where the characters grapple with Man's new role as the Creator of new life and the responsibilities that follow. He likens the movie as a visceral action film along the lines of James Cameron's Aliens with the intense spiritual core of Ridley Scott's Blade Runner. "Technology has taken us to the point where we have the ability to create a genetic duplicate of a living organism. How does that effect our understanding of the soul?" asks Cheng. "We can make exact replicas of software for virtually no resources and swap them over broadband networks. How does this effect our concept of ownership and value? And what if, someday soon, artificial life in the form of self-aware software, can be replicated, distributed, and reprogrammed just as easily? How will we welcome artificial intelligence? As threats to be protected from, power to be wielded, or simply life to be respected?" While influenced by Japanese serials like Masamune Shirow's Ghost in the Shell and Katsuhiro Otomo's Akira, Cheng got the inspiration for Deployment Strategy from his real world work as a software consultant. In 2005, Cheng was working as a consultant in the financial district of New York City and encountered a software bug in a program designed to asses risk factors for stock trading. All risk variables were being output at 10 times their normal value and no stocks were being recommended for purchase. Cheng playfully diagnosed the bug as Paranoid Schizophrenia to his client. The analogy served as the creative seed to Deployment Strategy where a military robot's buggy software causes fatal results. Cheng was this year's recipient of The Dusk Till Dawn Film Festival's Willie's Spirit Award, given to a single filmmaker per year who has, "achieved excellence despite overwhelming circumstances." Cheng guesses the overwhelming circumstances included the marathon year and half spent in post production. "In my story, technology runs amok. In real life, technology made it possible for me tell this story." Cheng used off-the-shelf software like Photoshop and After Effects, both published by Adobe Software, to single-handedly create over 100 digital special effects in the film. "Whatever I couldn't learn how to do on my own, I had to find people to help me." In 2004, Cheng was in preproduction for the film while getting his MBA at Rutgers University. "The talk at the time was outsourcing, outsourcing, outsourcing. How was it going to effect the tech sector? Were programmers in the U.S. going to be passed over to cheaper talent overseas? I decided to jump on the bandwagon and try it for myself." In the end, Cheng outsourced the composition of the epic musical score and 3D design to England. Approximately a dozen visceral 3D animation effects of flying buses and a military dropship were done by ArtDuck Studios in Poland. "We found each other and collaborated on the 'net via instant messenger and video conferencing software like AOL and Skype. Audio and video proofs were exchanged via a shared FTP server." Technology did help but Cheng also put in the man hours. "I started working at Nickelodeon 2 weeks after production wrapped, so the entire post-production process was completed outside my 50 hour work week. An hour on the train to and from work, 3 or 4 hours at night, and weekends... If you have a dream, you have to work for it." During the entire 2 and half year process of creating the film, Cheng has blogged meticulously about the experience on his website, http://www.iMustMakeThisFilm.com. The site served as both an online diary and a mantra to keep going. It has been featured in publications like Student Filmmaker magazine and media websites such as PixelSurgeon.com. Deployment Strategy has played in at least one film festival a month in every month since the film's completion. Cheng is self-distributing a limited run of the Deployment Strategy DVD on the film's website and on Amazon.com. About Mark Cheng: Mark Cheng is a software developer for MTV's Nickelodeon Kids & Family division. He has worked independently as a web consultant and graphic designer under his company, Creation Matrix LLC, which produced Deployment Strategy. Cheng is a 1997 graduate of Cornell University's Theater Arts/Film Production program and earned his MBA from Rutgers University in 2005 with a focus on entrepreneurship and high tech growth. He is currently writing a feature length sequel which he intends to finance through private equity next year. Behind the Scenes photos, concept art, special effects in-progress clips, and additional materials can be found at the official movie website and the director's production blog, http://www.iMustMakeThisFilm.com. For additional information and/or a screener DVD, contact director Mark Cheng via those sites' Contact Us forms or directly at 201-463-6777.